The Pisgah Conservancy, U.S. Forest Service, and a host of supporting organizations have announced a broad based volunteer work day in the Pisgah Ranger District called “Pisgah Pride Day 2016,” which is being planned in conjunction with National Public Lands Day, September 24. Work crews will convene at different locations on Saturday, September 24, and will perform trail work, surveying and removing invasive species, trash removal, brush trimming, river habitat projects, and more. Afterwards, volunteers will gather at Oskar Blues in Brevard to celebrate the results, with a percentage of beverage proceeds going to The Pisgah Conservancy. Volunteers do not need to be a member of any of the sponsoring organizations to participate, but must be signed up to work on Forest Service property. To sign up, go to www.pisgahconservancy.org/how-you-can-help/pisgah-pride-day-2016.html. Pisgah Pride will also include a “Pink Beds BioBlitz” at the Cradle of Forestry that starts on Friday evening, September 23 and will continue on September 24. A BioBlitz is an event dedicated toward applying citizen science in order to identify as many species of flora and fauna as possible in a designated amount of time in a defined area. The Pink Beds BioBlitz will include surveys, nature walks focusing on botany, entomology, ecology, birds, reptiles, amphibians, mushrooms, and more. Devin Gentry of the Cradle of Forestry in America Interpretive Association said “We are excited to have our first BioBlitz in the historic Pink Beds valley on this 100th anniversary of Pisgah National Forest. This will be a chance for the armchair naturalist and local school children to get out in the field and participate in important, hands-on service projects.” For specific information on the BioBlitz you can visit https://pinkbedsbioblitz.wordpress.com. On September 11, 2016 Doug Peters, Richard Kellogg, and Bill Tinkler will embark on a 10-day, 75-mile backpacking adventure on the Appalachian Trail through the Great Smoky Mountains National Park. Our goal is to increase awareness for the park, encourage people to visit, and raise funds for the 501(c)(3) non-profit organization, Friends of the Smokies. We’ve named our adventure-fundraiser “Friends in High Places,” and we want you to be our FRIEND. To find out why, watch this video (below)! For more information about the Friends In High Places group, and to donate, please click here. The Bureau of Alcohol, Tobacco, Firearms and Explosives (ATF) and the Kentucky State Police have issued a public safety advisory with regards to IEDs on trails in eastern Kentucky. In Harlan County, Kentucky there have been three confirmed incidents of improvised explosive devices (IEDs) being hidden inside trail cameras, which exploded and injured people. An operation was conducted and nine IEDs were located and dismantled. Other devices, however, may still exist. Some of the trail cameras were found abandoned on paths in rural areas routinely accessed via the Dave Smith Drainage Area (Woodland Hills Subdivision, Harlan, KY), on the Little Black Mountain Spur in Harlan County. These IEDs were designed to explode when a person inserted batteries into the trail camera. Other IEDs were designed to be detonated by a trip wire leading to the trail cameras. In some instances, containers such as milk jugs, protein powder containers, or paint cans were placed nearby the explosive device. In addition, there is information that a tree stand had been placed in the woods with an explosive device attached. Authorities caution people to not handle any trail cameras, tree stands, or any other items that they did not place themselves. If you locate a trail camera, tree stand, or other item for which an IED could have been connected that does not belong to you, do not touch it and immediately notify law enforcement, providing them with the GPS coordinates if possible. You can contact Kentucky State Police Post 10 (606-573-3131) or the Bureau of Alcohol, Tobacco, Firearms and Explosives (ATF) (859-219-4500). The man believed to have planted the devices was arrested back in June. On August 11th, while in federal custody, authorities brought the suspect back to Harlan County so that he could assist in locating the remaining live devices. At the trailhead, however, the suspect attempted to escape, but was fatally shot by Lexington Fire Investigator Captain Brad Dobrzynski. It is thought that the man placed the devices in the cameras in order to deter other people from stealing them. 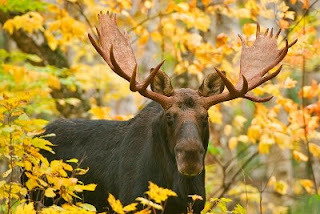 On the eve of the 100th anniversary of the National Park Service, U.S. Secretary of the Interior Sally Jewell and National Park Service Director Jonathan B. Jarvis today applauded the designation of the Katahdin Woods and Waters National Monument, the first national monument to preserve the landscape and honor the history and culture of Maine’s North Woods. The Antiquities Act, which was used to make this designation, permanently protects 87,500 acres of lands donated to the National Park Service earlier this week by the Elliottsville Plantation, Inc., (EPI). This land donation includes the East Branch of the Penobscot River and its tributaries, one of the most pristine watersheds in the Northeast. This weekend, Secretary Jewell will visit the national monument lands in Penobscot County, Maine, to celebrate the designation with state and local officials and members of the public. National Park Service staff will be on site to assist with the first steps to open the park. EPI is the nonprofit foundation established by Roxanne Quimby and run by her son Lucas St. Clair. Their gift of land is accompanied by an endowment of $20 million to supplement federal funds for initial park operational needs and infrastructure development at the new monument, and a pledge of another $20 million in future philanthropic support. The new national monument – which will be managed by the National Park Service and is now the 413th park unit in the National Park System – is located directly east of the 209,644-acre Baxter State Park, the location of Maine’s highest peak, Mt. Katahdin (5,267 feet), the northern terminus of the Appalachian Trail. The boundaries of the new national monument also include 4,426 acres of private land owned by the Baskahegan Company, which requested inclusion should the company in the future decide to convey its lands to the United States or a conservation buyer, on a willing seller basis, for incorporation into the monument. The Katahdin Woods and Waters National Monument designation is the result of a years-long effort by Quimby and her son. Quimby purchased the lands with a portion of the wealth she created as a co-founder of Burt’s Bees in 1984, and developed the idea of gifting the lands to the American people as part of the National Park System. St. Clair, raised in Maine and dedicated to preserving the landscape and access for recreational activities, and a small EPI staff, have been operating the lands as a recreation area for several years. The new national monument includes the stunning East Branch of the Penobscot River and a portion of Maine’s North Woods that is rich in biodiversity and known for its outstanding opportunities to hike, canoe, hunt, fish, snowmobile, snowshoe and cross-country ski. These and other traditional activities will continue to be available in the new national monument. The new monument is also a storied landscape. Since the end of the last Ice Age 12,000 years ago, the waterways, wildlife, flora and fauna, night skies, and other resources have attracted people to the area. For example, the Penobscot Indian Nation considers the Penobscot River watershed a cultural and spiritual centerpiece and since the early 19th century, logging has been a way of life. Artists, authors, scientists, conservationists and others – including Teddy Roosevelt, Henry David Thoreau and John James Audubon – have also drawn knowledge and inspiration from the area’s resources. National Park Service staff will hold a series of public listening sessions throughout the Katahdin region starting the week of September 12 to begin work on the management plan that will be developed during the first three years. Details of the listening sessions, including dates and locations, will be shared with local newspapers and posted to the monument’s website (www.nps.gov/kaww). NPS’s planning will be done with full public involvement, with special emphasis on understanding the ideas and concerns of the local communities. The approximately $100 million total gift to the American people from the EPI, was facilitated by the National Park Foundation as part of its Centennial Campaign for America’s National Parks. Forest health officials with the U.S. Forest Service have discovered declining ash trees due to infestation by the emerald ash borer (EAB) whose presence was confirmed on the Appalachian Ranger District of the Pisgah National Forest and on private lands along the French Broad River from the Tennessee state line to Marshall, NC. Decline and death of ash from EAB occurs in a relatively short period of time (one to two years). Ash tend to become brittle very soon after they are killed leading to mid stem failures of trees in the infested area likely beginning within the next year. Hazard tree mitigation for EAB-killed ash trees should begin as soon as possible after the tree dies. Hazard tree migration for EAB affected ash is generally much safer when trees are removed as they die as opposed to when they reach full mortality and become very unstable. The U.S. Forest Service will focus hazard mitigation work on ash trees located in developed recreation areas like campgrounds and picnic areas though affected trees will be present throughout the forest. Forest visitors should be cautious along roads and trails as the ash mortality is likely to be high in affected areas across the district. Check your suroundings before placing your tent or resting under a tree canopy. Avoid dense patches of dead trees. Be vigilant and look up for trees with broken limbs or tops as you drive forest roads or hike forest trails especially in windy conditions. Trees and branches can fall at anytime but are much more likely during wind events or following ice or snowstorms. 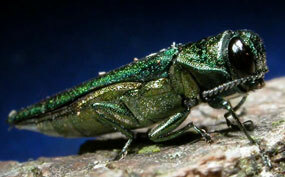 Adult EAB beetles are metallic green, about 1/2-inch long, and attack only ash trees leaving a D-shaped hole when they emerge from the tree in spring. Individual trees can be saved if they are chemically treated before decline symptoms are present. More information is available at www.emeraldashborer.info including a bulletin describing the signs and symptoms of EAB and an insecticide fact sheet. This Wednesday, August 24th, is the 22nd annual Friends Across the Mountains Telethon. The event will again be broadcasted on WBIR-TV Channel 10 in Knoxville, TN and WLOS-TV Channel 13 in Asheville, NC from 7:00 PM - 8:00 PM. The broadcast will highlight projects and programs that Friends of the Smokies has funded over the years. It's a fun event that raises awareness of both the Park's needs (as the only major national park without an entrance fee), and the ways that Friends of the Smokies helps to fulfill some of those needs every year. The telethon raises roughly $200,000 each year, and has raised more than $3 million dollars over the last 20+ years. Shenandoah National Park has announced that the Snead Farm Fire Road and Snead Farm Loop Trail have been reopened to hikers, but remain closed to visitors with dogs. These trails are located near the Dickey Ridge Visitor Center (mile 4.6 Skyline Drive) in the North District of the park (see Map). 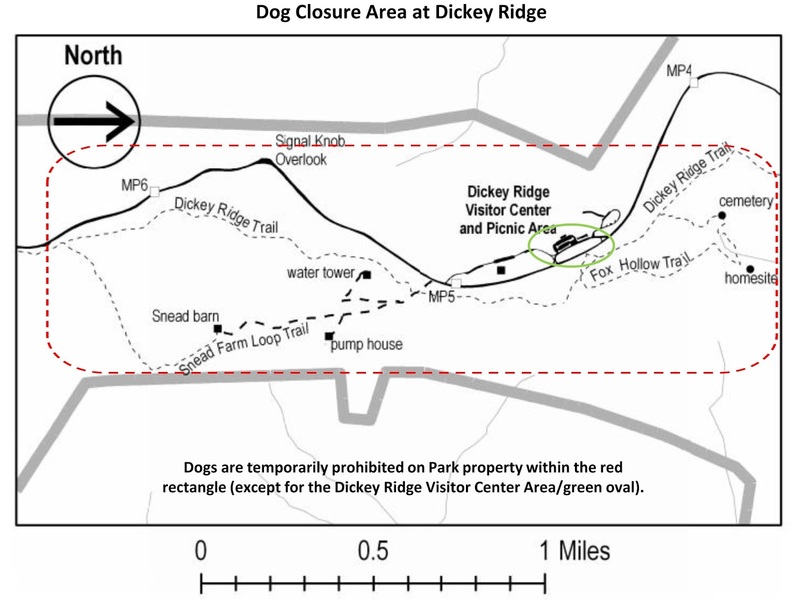 Because of recent incidents with bears and dogs the greater Dickey Ridge area remains closed to visitors with dogs (see Map, red rectangle), however, the open/mowed area immediately surrounding the Dickey Ridge Visitor Center and restrooms (see Map, green oval) is open to dogs on a 6-foot leash. During the closure period from August 4-18, 2016, park staff regularly patrolled the trails and monitored with remote trail cameras. No additional unusual bear behavior was documented on those trails during the closure period. Great Smoky Mountains National Park Superintendent Cassius Cash and City of Gatlinburg Mayor Mike Werner invite the public to join them on a hike along the Gatlinburg Trail on Saturday, August 20 at 9:00 a.m. in honor of the National Park Service Centennial. Hikers should meet in front of Sugarlands Visitor Center to begin the 4-mile, round trip hike which follows the West Prong of the Little Pigeon River to Gatlinburg. Superintendent Cash has committed to hike 100 miles in the park during 2016 and has challenged the public to do the same. The 100-mile goal is part of the “Smokies Centennial Challenge-Hike 100” program. This program aims to inspire all potential hikers—young and old, new and skilled—to experience and gain a new appreciation and stewardship for their national park. Over 350 people have already met the challenge and recorded hiking over 100 miles in the park. Cash has led hikes with over 170 participants to date including 90 young people from youth organizations. To complete the Hike 100 challenge, participants must hike any 100 miles of maintained trail within the park boundaries between January 1 and December 6, 2016. These miles can include everything from the front country nature trails to the extensive backcountry network of trails. Participants can choose to hike the same trail repeatedly or choose to hike many different trails to accumulate a total of 100 miles. Participants who reach the 100-mile goal will earn a commemorative “Smokies Centennial Challenge – Hike 100” pin and be invited to a park celebration hosted by Superintendent Cash. As part of the Hike 100 program, the park is hosting hikes for several regional youth organizations throughout the year. These opportunities will provide a chance for groups, who otherwise face barriers to travel due lack of transportation or funding restraints, a chance to explore the Smokies. 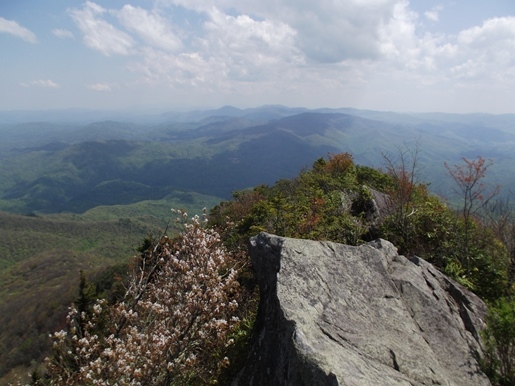 These groups will have the added benefit of hiking alongside Superintendent Cash, as well as experienced hikers from the Smoky Mountains Hiking Club and Carolina Mountain Club. The Superintendent is also providing a unique opportunity for the general public to hike alongside him on his way to reaching the 100-mile goal through a series of four hikes open to the public including this hike on August 20. Information about the dates, trails, and how to sign up for one of these public hikes is provided on the park website on the Hike 100 page. 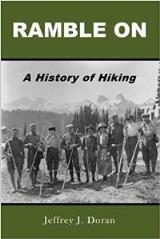 In addition to information about the public hikes, the Hike 100 page on the park website provides opportunities for the Superintendent and hikers to share their experiences and reflections about their journeys towards their 100 miles, and a hiking log that participants can use to track their miles. Please visit the website at www.nps.gov/grsm/planyourvisit/gsmnp-hike-100.htm. The Smokies Centennial Challenge – Hike 100 program is made possible in part by an Active Trails grant from the National Park Foundation through the generous support of The Coca-Cola Company and The Coca-Cola Foundation as well as through the continued support of Great Smoky Mountains Association and Friends of the Smokies. For more information about the Smokies Centennial Challenge-Hike 100 program, please visit the park website or contact them by email at gsmnp_hike_100@nps.gov. On Wednesday, August 3rd, a hiker in Shenandoah National Park reported an encounter with a mother bear and two cubs on the Snead Farm Fire Road near the Dickey Ridge Visitor Center (mile 4.6 on Skyline Drive). The hiker was accompanied by two dogs on retractable leashes. Confronted by the bear, the hiker fled the area, at which point the bear attacked the trailing dog who later died of its injuries. As a result, the Snead Farm Fire Road and Loop Trail will remain closed while park staff monitor the area. Hikers with dogs are asked to avoid the Dickey Ridge Area. "Park Superintendent Jim Northup said "We are very sad to learn about this dog that died as a result of injuries from an encounter with a bear in the park. 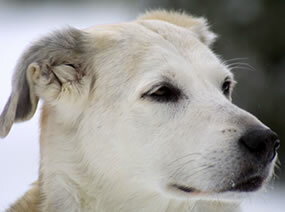 This is a very rare event, and we offer our condolences to the dog's family". This isn't an isolated incident. According to a study conducted by Stephen Herrero and Hank Hristienko, both leading authorities on bear behavior, dogs were involved in more than half of all black bear attacks between 2010 and 2013. The study didn't mention grizzlies. Bears aren't the only issue for dogs in the backcountry. Moose have also injured hikers while out on the trail with their dogs. Here and here are two relatively recent incidents in Colorado alone. If you look at other park websites they also cite similar reasons. If these are legitimate factors in the Smokies, and nearly every other national park, why aren't they factors in Shenandoah National Park? Or in all of our national forests for that matter? U.S. Secretary of the Interior Sally Jewell should implement a consistent policy that protects wildlife, visitors and pets across all backcountry areas managed by the agency. The National Park Service invites visitors of all ages to join in the celebration of its 100th birthday throughout the month of August. With special events across the country, and free admission to all 412 national parks from August 25 through August 28, the NPS is encouraging everyone to #FindYourPark for the centennial. "August –our birthday month –will be a nationwide celebration of national parks, and we're inviting everyone to the party," said National Park Service Director Jonathan B. Jarvis. "We like to think that we look pretty good for 100, and with so many events and activities to commemorate this milestone, we hope all Americans will join us to celebrate the breathtaking landscapes and inspiring history in our nation's parks and public lands. Whether it is in a distant state or in your own community, there are hundreds of ways and places to find your park." On August 22, the three-part series of Park Exchange events will culminate in New York City, taking the innovation from Thomas Edison National Historical Park in a small New Jersey town, to the iconic big city skyline. A day of free family-friendly activities will explore the concept of innovation and 100 years of national parks, and a special evening program will illuminate Edison's innovative spirit and light the way as the NPS enters its second century of service. A sampling of additional events is available on the National Park Service website, and hundreds more can be found at FindYourPark.com. 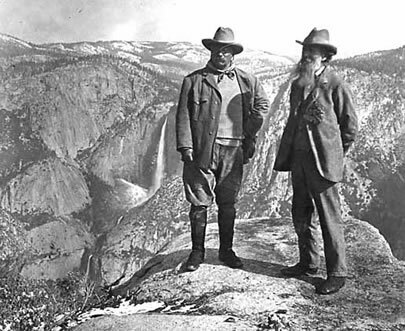 On August 25, 1916, President Woodrow Wilson signed the act that created the National Park Service "to conserve the scenery and the natural and historic objects and the wild life therein and to provide for the enjoyment of the same in such manner and by such means as will leave them unimpaired for future generations." Park entrance fees will be waived nationwide from August 25 through August 28 to encourage everyone to celebrate the NPS 100th birthday.Usually, 127 of the 412 national parks charge entrance fees that range from $3 to $30. The entrance fee waiver does not cover amenity or user fees for activities such as camping, boat launches, transportation, or special tours. To continue the national park adventure beyond these entrance fee free days, the $80 America the Beautiful National Parks and Federal Recreation Lands Pass allows unlimited entrance to more than 2,000 sites, including all national parks, throughout the year. There are also a variety of free or discounted passes available for senior citizens, current military members, fourth grade students, and disabled citizens. Three years ago Kathy and I made our first visit to Mt. Rainier National Park. During that trip we had the pleasure of hiking the Skyline Trail, which does a wide loop through the Paradise Valley. This instantly became one of the best hikes either of us has ever done. So, returning three years later, I really wanted to hike in this valley once again. Unfortunately, because this most recent visit was in mid-June, we didn’t have a lot of hope of doing much here, as this area of the park was still covered in several feet of snow. We assumed there would be no access to the trails. Well, we assumed wrong. On our last full day in the park we drove up to Paradise to assess the situation ourselves. Although extremely crowded, we were able to find a parking spot. Once on the scene we could see several dozen people hiking along the trails in the area. So we decided to go for it ourselves, and simply travel up the Skyline Trail for as far as we could go. The first section of trail up to the Alta Vista trail split was almost completely snow free. However, just beyond that, we began walking through heavy slush, and then snow. As you might expect travel became fairly slow once we hit the snow, but it was an absolute blast! At first our goal was to simply go to the Alta Vista overlook. However, once we reached that point we decided to continue further up the mountain. 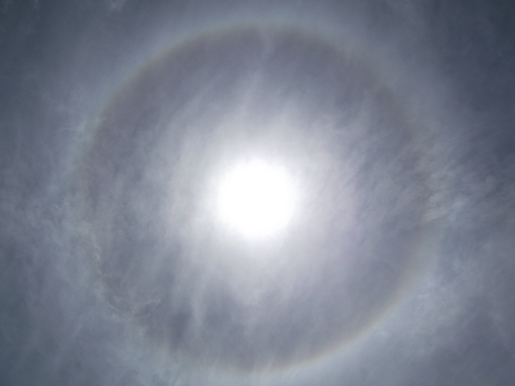 As we climbed higher we noticed a halo around the sun. Sun halos are the result of high thin cirrus clouds floating in the upper atmosphere, which causes light to refract after passing through the tiny ice crystals within the clouds. Halos usually signal an incoming weather front. Sure enough, less than 15 hours later it was raining in the park. We hiked about a mile up the mountain – stopping somewhere just below Glacier Vista. Throughout our hike we enjoyed some absolutely spectacular views of Mt. 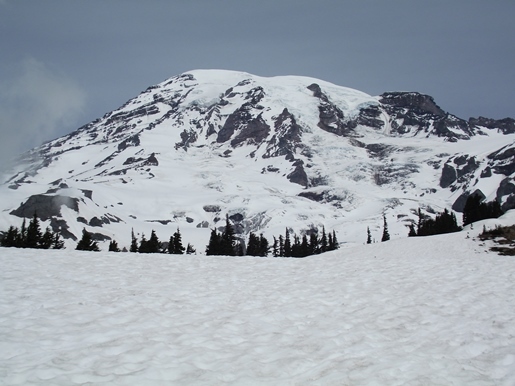 Rainier towards the north, and the Tatoosh Range towards the south. There were many people who hiked even further up the valley, including a few skiers. As strange as it might seem, it was extremely hot that day, even though there was snow all around us. If you wish to learn more about hiking the entire Skyline Loop Trail you can click here to check out my photos and read my trip report from three years ago. Day Hike! 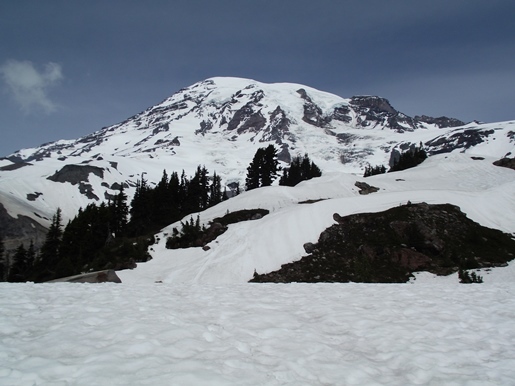 Mount Rainier uncovers the best trails for the day tripper, whether you’re a newbie hiker or a veteran with hundreds of miles on your boots. Northwest outdoors expert and Seattle Times's Trail Mix columnist Ron Judd reviews more than 50 of the best day hike trails in Mt. 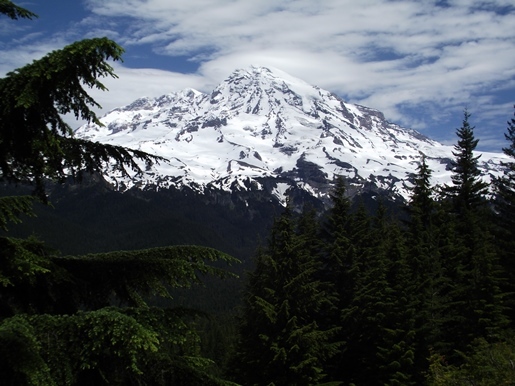 Rainier National Park, from Paradise and Sunrise to the lower foothills. The book describes classic routes - from easy to moderate to extreme - giving hikers the choices they want. Late last week Tennessee Gov. Bill Haslam applauded the award of a $10 million federal Transportation Investment Generating Economic Recovery (TIGER) grant to the Tennessee Department of Transportation to complete construction of the last 16-mile stretch of the Foothills Parkway. The state will contribute an additional $15 million in funds toward the $35 million total project cost, with the National Park Service contributing the remaining $10 million. Once finished, the Foothills Parkway will provide a continuous 33 mile connection to the Great Smoky Mountains National Park. The Foothills Parkway was constructed in sections beginning in 1960. Due to funding limitations and environmental challenges, a 16 mile stretch was never completed. Work to construct several bridges along this section began in the late 1990s. Final pavement and safety feature design work began in 2013 and is now ready for construction. The last project will include paving, and the installation of roadside barrier and other safety features. The extended parkway will provide a link for public and privately owned tourism amenities and surrounding communities, as well as to new and existing destinations along the parkway itself. “Completing this section of the Foothills Parkway will move forward one of the most critical tourism projects in East Tennessee,” TDOT Commissioner John Schroer added. “It would not have been possible without the strong and committed partnership between the state and the National Park Service. Construction on the final stretch of the Foothills Parkway is likely to begin in early 2017, and is expected to take 12-18 months to complete. After completing our hike to Comet Falls, perhaps the most impressive waterfall we’ve ever seen, we decided to do another waterfall hike later that afternoon. 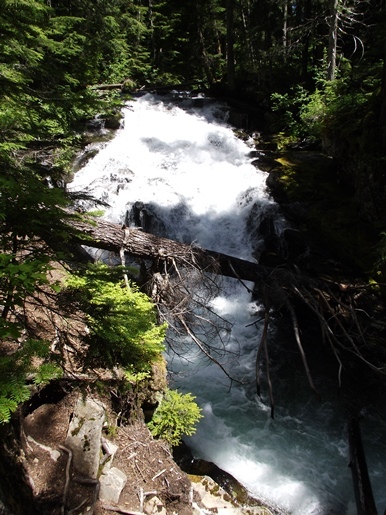 Our choice was Carter Falls and Madcap Falls, a hike that received a fairly high user rating on the Washington Trails Association website. 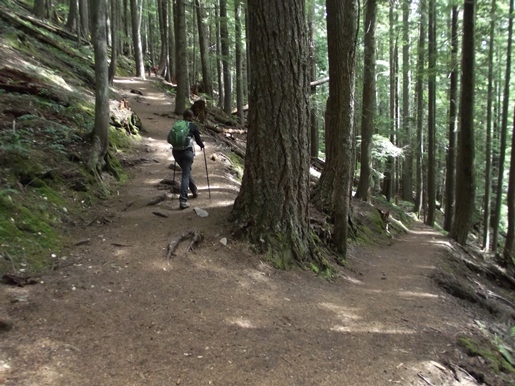 This short hike begins just below the Cougar Rock Campground. 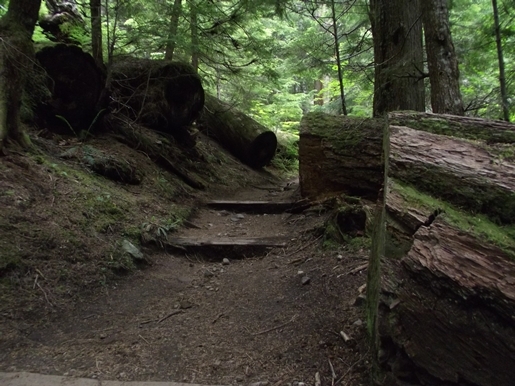 Hikers will follow the Wonderland Trail to reach both waterfalls. 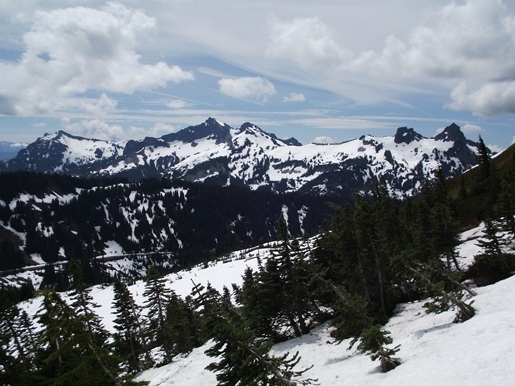 The 93-mile Wonderland Trail is an epic backpacking route that circumnavigates Mt. Rainier. 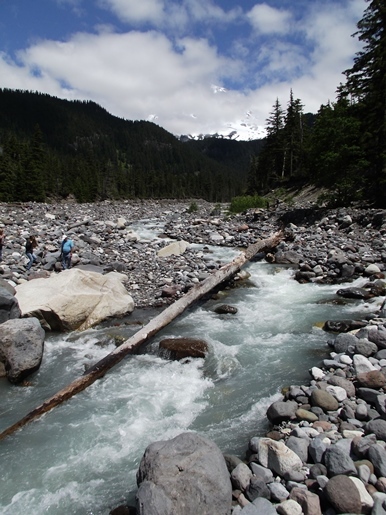 From the trailhead hikers will pass through glacial debris littered along the Nisqually River. Although it appears to be a short distance, it does take a little bit of time to walk through the maze of rocks and boulders. You’ll have to do a little bit of route finding at times, but it’s pretty straight forward. On clear days you’ll enjoy spectacular views of Mt. Rainier from the river basin. After crossing the Nisqually you’ll notice that the Paradise River feeds into the Nisqually just downstream from the footbridge. Once on the other side the trail begins to follow along the north bank of the Paradise River to reach both waterfalls. During the first six-tenths of a mile the trail travels over mostly flat terrain, but then begins to climb a moderate grade towards the falls. 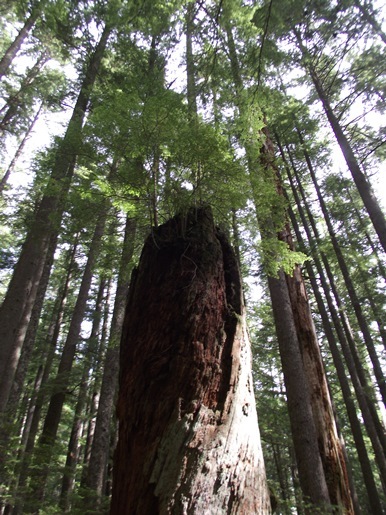 As the trail proceeds higher you’ll pass through an old-growth forest where some of the trees appear to be several hundred years old. At just 1.25 miles you’ll reach Carter Falls. Unfortunately, due to the trees, you won’t have a clear view of the 53-foot high waterfall. 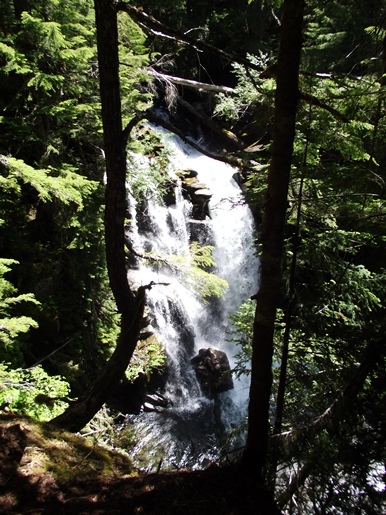 The waterfall was named for Henry Carter, a guide who built the first trail to Paradise. If you’ve already done most of the hikes in the park, and are looking for something new, this is certainly a decent hike to consider. However, if you’re relatively new to the park, there are many other hikes that offer far more scenic destinations than this one. Kathy and I intended to hike the Rampart Ridge Loop during our first visit three years ago, but didn’t due to heavy rain on the last day of our trip. Given that the hike offers great views of Mt. Rainier, and the fact that it was already snow free, it was near the top of our list of hikes for our mid-June visit this year. The loop hike begins across the street from the National Park Inn at Longmire. Once on the other side of the road you’ll gain access to the Trail of the Shadows, a short loop trail that visits an old homestead cabin. Even though the arrow points to the right, you’ll want to turn left to proceed directly towards the Rampart Ridge Trail. You’ll reach the Rampart Ridge Trail junction in less than two-tenths of a mile. From the junction the trail climbs moderately through a beautiful old-growth forest. For me, this was one of the most pleasant hikes one could take just about anywhere. Although this might be a bit of hyperbole, it seems that the trail is so well manicured that you could practically ride a road bike on it. 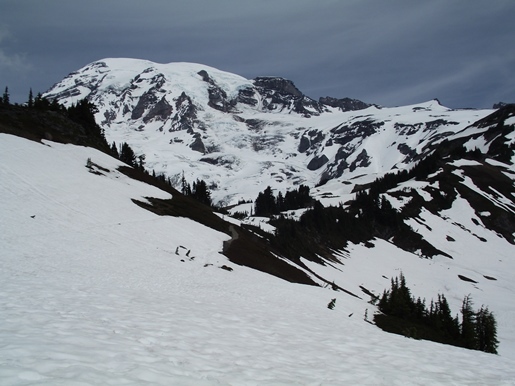 Rampart Ridge, also known as "The Ramparts," is the remnant of an ancient lava flow that originated from the summit of Mt. Rainier. 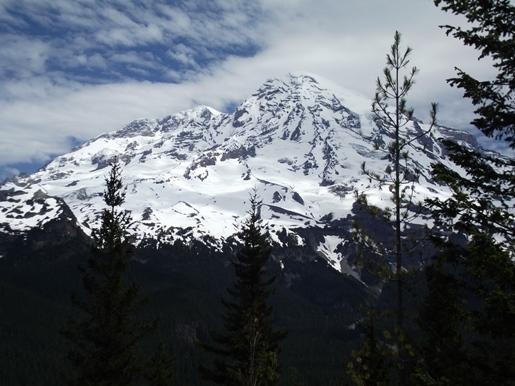 At just under 2 miles hikers will reach a side trail that leads to an overlook of the Nisqually River Valley. Look for a sign that reads “Viewpoint 200 feet”. Just beyond the viewpoint the trail reaches its highest point, and at roughly 2.25 miles, will make a sharp bend towards the left. Peer through the trees at this bend and you’ll notice a rock outcropping not far off the trail. 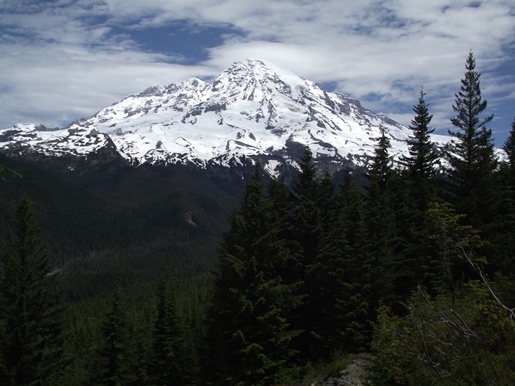 Although there are a few trees around, this vantage point still offers some outstanding views of Mt. Rainier. This is probably the best place for an extended break on this hike. Roughly 50 yards beyond the rock outcropping, as the trail begins to make a sharp descent, you’ll enjoy some unobstructed views of Mt. Rainier. This will be your most scenic view on the hike. A short distance from here the trail heads back into the forest. 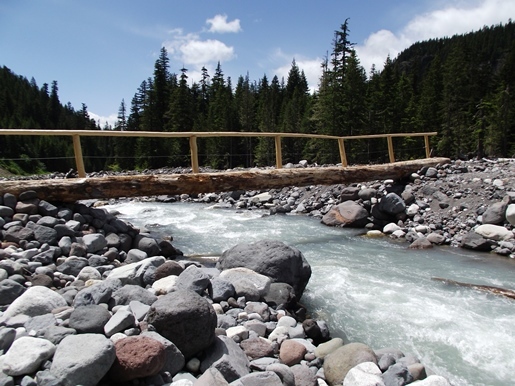 At 3.1 miles hikers will reach the Wonderland Trail, an epic 93-mile trail that circumnavigates Mt. Rainier. To complete this loop you’ll have to take a right here. From the junction the Wonderland Trail begins to descend fairly rapidly towards the Nisqually River. As you descend you’ll travel along a stretch of trail that passes through some ancient trees, many of which appear to be several hundred years old. At roughly 4.9 miles you’ll cross over to the south side of the main park road, and shortly thereafter, will return to the parking area at Longmire.